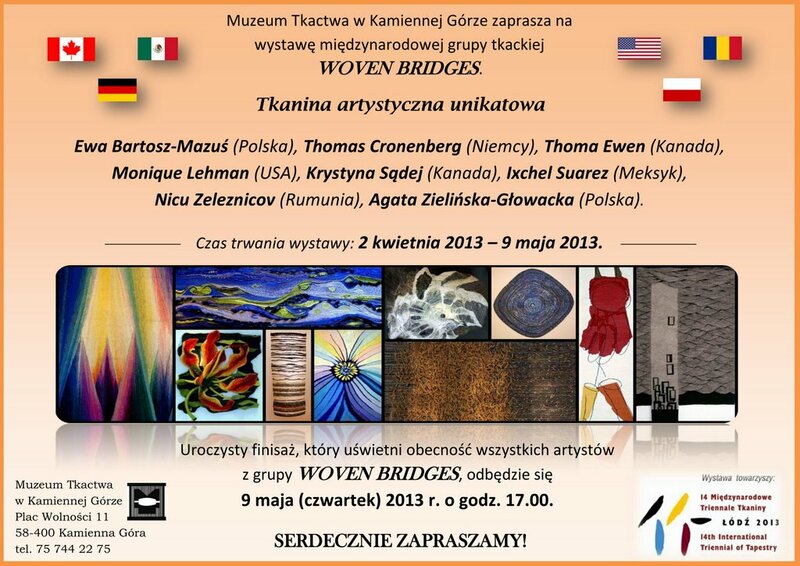 “Woven Bridges” at Muzeum Tkactwa, Kamienna Gora, Poland from April 2 to May 9, 2013. Today tapestry can represent a remarkable beauty and a kind of textured poetry, and it can also represent three-dimensional rebellion against conventional outlooks. 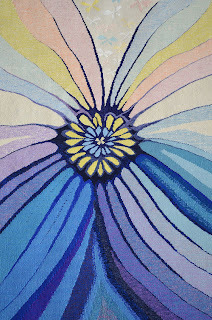 Woven Bridges showcases a variety of woven textile art, sharing and communicating the woven tapestry medium as contemporary fibre art”. The Woven Bridges exhibit at Muzeum Tkactwa, the Museum of Weaving in Kamienna Gora, Poland, from April 2 to May 9, 2013 features a fibre art group with three Canadian Artists: Thoma Ewen, Krystyna Sadej, Ixchel Suarez and five invited guest-artists: Ewa Bartosz Mazus from Poland, Monique Lehman from United States, Thomas Cronenberg from Germany, Zofia Werblicka from Poland and Nicu Zeleznicov from Romania. Woven Bridges demonstrates the very strong connection between Canadian, American and European artists who share the same interest and love of tapestry weaving. This exhibition comprehensively demonstrates the dynamic field of contemporary woven textile art, in which a rich variety of materials, diverse techniques and experimental forms can produce works of striking diversity and originality, combining humour and seriousness, recycling, and reflections on the nature of everyday life.